The following is a report submitted by a citizen in northern California. This report adds to the chain of evidence that has been brought forth for nearly seven years now on the subjecting of the populace to unidentified airbone contaminants. This report demonstrates that there are very likely significant health consequences that accompany these atmospheric operations. The report also demonstrates that the United States Environmental Protection Agency has completely failed in its mission to serve the public and to protect the health and welfare of our environment. 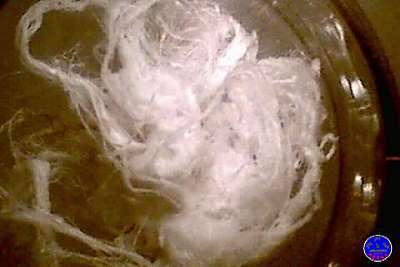 The fibers reported here appear to be, in all respects, identical to those that the EPA has refused to identify when originally requested to do so more than six years ago. The ‘policy’ of the EPA on public record is that they will not test, identify or examine any ‘unsolicited material’. 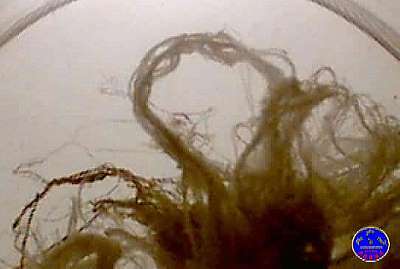 The minority argument of claiming an ordinary origin to these fibers, such as spider webs, has long ago been shown to be unreasonable; these materials are evaporative and transformational in nature, and they display unusual dimension, mass and character. It is long past the point where the EPA must be challenged in a legal sense on their position. The sooner that this is recognized by U.S. and international citizens and acted upon, the sooner that we can restore the health and welfare of our atmosphere. This reparation will not occur without confrontation, and we will continue to pay the price for apathy and submission to these violations of natural law and divine right. I would recommend that pressure in the strongest form be brought to bear on the representatives of government of this nation if we wish to be able to breath and live in health. The submission of the citizens of this nation to the EPA ‘policy’ has brought no resolution to the wanton failure to protect life and environment. There is an appropriate time for confrontation and rejection of the untenable EPA ‘policy’, and this point in time has already passed. An organized challenge by the public to the U.S. Environmental Protection Agency is necessary to halt the EPA’s condoned contamination and degradation of our planet and atmosphere. Extensive observations, records, analysis on similar airborne fibrous materials and the EPA historical correspondence on this subject are available on this site. Much appreciation is extended to Mr. Challender for his substantial effort in making this report available to the public. This is a report on the event of Sunday, 13 November 2005. It began at approximately 12:50 PM PST over my home in North Highlands California. At the time, my son was playing in our back yard. Since I have been following chem–spraying over our home for more than two years, he is accustomed to alerting me when he sees such activity. At the time mentioned above, my son called me to look at the sky. Indeed, the sky was full of the “sheets” of material we usually see as chem-trails spread out after spraying operations. In particular there was a plane leaving a long, non-dissipating, emission to our east. I had my wife bring me our Vivitar 3300 digital camera as fast as possible. I photographed the aircraft and its trail as best I could from my position. I also took one shot of a recent trail, which was spreading fast. Had I known what was to come in about two hours time, I would have taken more than four shots of the skies that afternoon… Instead, I returned to my office to resume working on my website. At around 3 PM PST my son, in a very excited state, called me to come look at the sky again. I made my way to the back yard, and stood transfixed. 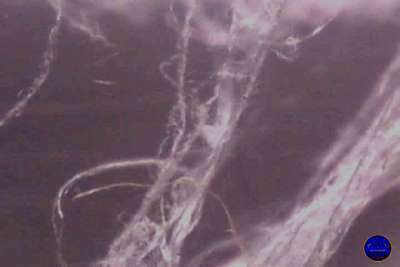 Before my very eyes, strands and clumps of a white fibrous material were falling from on high. This material was snagging in the trees, alighting on houses, the grass, and parked cars. I was so stunned, I’m afraid I forgot to get photos of this phenomenon. I’m regretting that failure now! I did think to ask my 18 year old son go about with small sticks and twigs he could find, and collect samples of the material. He was quite willing to help. I am permanently disabled due to spinal injury some 6 years ago. My mobility is limited, because my legs no longer function normally. For this reason, I rely on my son to be my “legs” when necessary. I cautioned him NOT to touch the stuff, nor to get it in his eyes, hair, or on his clothing. He was careful, and suffered no apparent ill effects. Unfortunately, my wife did mash some of the substance between her fingers, expressing that it felt “waxy”. She visited our family Doctor four days later, with an itching rash problem… The rash has since cleared up with the application of an ointment prescribed by the Doctor. He was not able to diagnose the exact cause. Within minutes, the “fallout” had all disappeared! Outside, it had all melted, evaporated, or just dissipated. Very curious. I have never seen anything like this event before, but had heard of it on the Internet. We put the collected samples into a small jar with a snap-on cap and left it in my office over night. The thought was to get the sample to Mr. Clifford Carnicom, as I believed he could have it analyzed in a laboratory. When we examined the jar of material on Monday 14 November, two-thirds to three-quarters of the sample was gone. I photographed the jar, and what was left of the sample. We then tried to hermetically seal it using packing tape around the cap and rim. 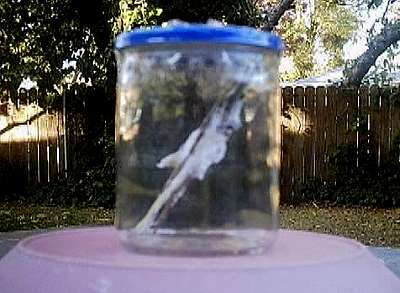 It was hoped that perhaps a partial pressure of the “evaporating” material developing in the jar would cause the air inside to become saturated; impeding or halting erosion of the sample. This simple procedure appears to have had limited success, as the sample did “survive” into the week. On Tuesday, 15 November, we took photos of the jar once again. Some of the material was definitely missing, but the loss was far less than during the first 24 hours. I also made a phone call to Ms. Fels, an associate of Clifford Carnicom, that evening. She gave me contact information for Mr. Carnicom. On Wednesday, 16 November, Mr. Carnicom and I had a very pleasant and productive conversation regarding the events of Sunday 13 November. It was most disappointing to learn that there was no chance of having a chemical analysis done on the material. Imagine my surprise to find out that the Federal Environmental Protection Agency has no interest in dealing with samples like my son had collected. 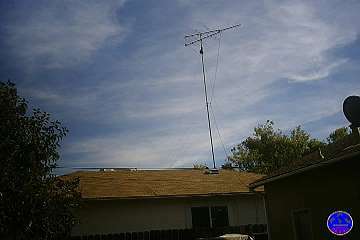 This is the US government agency chartered to protect citizens from hazardous chemicals in the air, water, and land! One has to wonder why this tax-supported “agency representing the interests of the people” refuses to investigate allegations, from tax-paying citizens, that SOMEONE is spraying the skies with chemicals DETRIMENTAL to the environment we all live in. Adding insult to injury, they flatly refuse to even examine physical samples of the alleged chemicals! WHO DO THESE PEOPLE THINK THEY WORK FOR?? Mr. Carnicom therefore suggested that I do what I could with the sample on my own. Naturally, he urged the utmost care in dealing with the unknown material. So, per Mr. Carnicom’s suggestions, I worked with the sample myself on Thursday 17 November. I connected my Intel QX3 USB microscope to my main work PC. My wife set up a “safe as possible” work area for me, with good ventilation and plenty of light. I took one last set of pictures of the jar, and removed the sealing tape. I was not prepared for what happened when I popped the cap off the jar, though… It seems that when we sealed the jar with the packing tape, it did build up a concentration of whatever this material becomes when it breaks down. I was hit in the face with some sort of extremely noxious gas! My eyes burned fiercely, and I began coughing desperately. There was a very strong metallic taste on my tongue as well. It took several minutes to recover from this terrible bout. I worry what the long-term effects might be, but in the short term I did not get sick or feel any incapacitation. I was determined to continue, however. So, the sample was removed from the jar, and placed on a glass plate. Using plastic tweezers, and a stainless steel penknife, I stripped what material was left from the twigs and sticks. I place one-third into a sample container for storage in the freezer, and another third into another container for storage in the refrigerator. The last third went into a capped examination chamber for the microscope. All of the containers used were supplied with the Intel QX3 microscope. In all, the remaining sample amounted to about one tablespoon. Not much at all considering the volume in the jar that first day. In the beginning, there was an estimated four tablespoons worth. 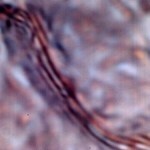 I spent over an hour examining the material, and capturing images with the microscope software. The examination included use of the 10x, 60x, and 200x magnification settings. 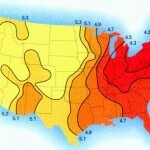 It also saw the use of top, and bottom lighting at low, medium, and high intensities. After capturing the images, they were processed in my PC for the web. It is only a gross examination, as I have no facilities for a proper scientific analysis of the sample. The images are included with this report for study by anyone who might be interested. I hope that my efforts have been of some service to the greater goal of exposing what some corrupt authorities are doing to our skies, and to the inhabitants of the world. This report, and accompanying images, may be freely reproduced and distributed. None of it may be used for monetary profit in any form.